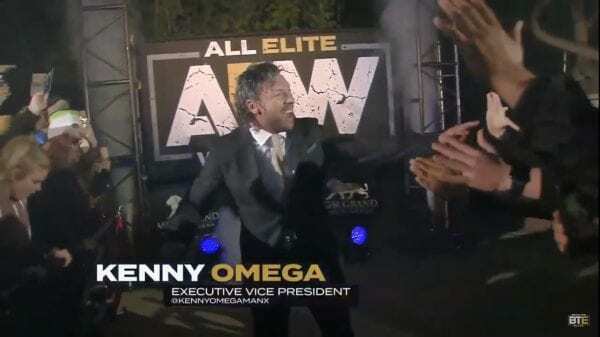 Kenny Omega capped off AEW’s second rally. This time they decided to throw the party in Las Vegas, the home for Double Or Nothing. Jacksonville would have much warmer. Things really heated up when Kenny Omega made his way to the ring. Chris Jericho soon followed and there was a pull apart on the stage. It wasn’t announced during his speech, but Kenny Omega’s nameplate on the graphic said “Executive Vince President” under his name. This was very likely done for a reason. Dave Meltzer mentioned on Wrestling Observer Radio after the initial AEW announcement that there was a plan to add another Vice President eventually. It looks like Kenny Omega might have filled that role. Now if you’re keeping track AEW has four Vice Presidents in Tony Khan, Nick Jackson, Matt Jackson, Cody Rhodes, and now The Cleaner.